Greg Hardy, who finished third in the NFL with 15 sacks, is one of 21 Panthers set to become an unrestricted free agent. CHARLOTTE, N.C. — Mike Mitchell’s voice started to crack, the emotion of a missed opportunity starting to show. He spoke about wanting "so badly, so badly" to be back with the Panthers, back for an opportunity to avenge Sunday’s playoff exit at the hands of the 49ers. But no one knows at this point if that’s in the cards. "I want to come back here and finish what we started, finish this the right way, with this group of men," Mitchell said after the 23-10 loss to the San Francisco in the divisional round. "I haven’t played on a team with this type of coaches, these type of teammates probably since I was a 17 year old boy. Great group of guys and I want to finish this. " But so many on this roster won’t be back in Charlotte, won’t be back to atone for what they’re currently feeling, with 21 players set to become unrestricted free agents, including eight starters. There’s no question the future is bright in Charlotte with the building blocks currently in place — Cam Newton on offense, Luke Kuechly on defense. But who will be around them is yet to be determined. The first offseason priority for general manager David Gettleman will undoubtedly be breaking the bank to lock Newton into a long-term extension. But there’s only so many dollars to go around and that may mean guys like Mitchell, who signed a one-year-deal with the Panthers last offseason, and will be an unrestricted free agent after dramatically outplaying his $745,000 contract, could call a new locker room home next season. The locker two down from his — Captain Munnerlyn’s — will be cleaned out tomorrow afternoon as well, unsure if the fifth-year cornerback will be back for his sixth season. Munnerlyn, like Mitchell, signed a one-year-deal last offseason and could be forced to leave the Carolinas, the only place he’s ever known after playing his collegiate ball at South Carolina. "I love Carolina. They drafted me. I went to school an hour away, that’s the best thing about it," Munnerlyn said. "I bought a home here and I want to stay here." Then there is Newton’s blindside protector, Jordan Gross. He’s spent the last 11 years in Charlotte after being drafted eighth overall in 2003 but isn’t sure if he’ll retire, isn’t sure if his body can take the pounding for another one and isn’t sure if the Panthers even want him back. "I haven’t talked to the team at all," the left tackle said. "You don’t come to a crossroads very often in your career, first time its happened with me, so I’ll heal up and not make a rash decision based on the way my body feels right now. I don’t know what’s going to happen. We’ll see." One thing’s for certain: Gross doesn’t see himself anywhere other than Charlotte — whether that’s playing or figuring out where the next step in life is going to take him. "I don’t want to move," he said. "I plan on working here one way or another here for a long time, so we’ll see what happens now." The same can’t be said for the Panthers’ second-biggest offseason priority — Greg Hardy. 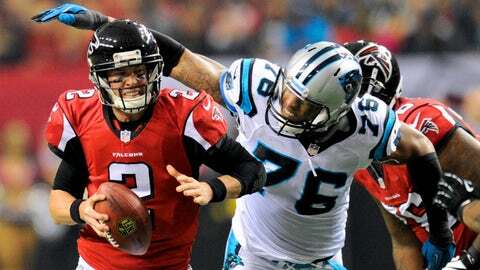 His seven sacks in the last two games — and 15 on the season — has assured him of a monster deal after he and the Panthers were unable to come to an agreement on an extension last offseason. His agent Drew Rosenhaus was at the game Sunday and Hardy said he would be willing to give the Panthers a small hometown discount, but will there even be enough money to make that happen and keep Hardy in Carolina? "I hope so. You never know. That is something that Dave Gettleman and I will sit down and address," head coach Ron Rivera said. "Dave will have a plan obviously and believe me he has done a great job with the plans he has had for us this season." It will be increasingly interesting to watch Gettleman’s offseason plans because he’ll largely have to retool at the team’s three weakest positions — wide receiver, secondary and offensive line. Steve Smith, 34, said he’ll be back, but the rest of the wide receiving corps is in flux. Brandon LaFell, Ted Ginn and Domenik Hixon are all unrestricted free agents, and wide receiver definitely seems like an area the Panthers will target in the Draft. "I hope to be back, but if I don’t I’m going to miss a lot of these guys, especially the guys that came in with me like Greg Hardy," LaFell said. "He’s one of only two left in my draft class. My big brother Smitty, I’m going to miss that guy if I don’t come back. I want to be back here and I want to win with this team and the guys I’ve been with the last four years." The offensive line’s been patchwork all season with Amini Silatolu, Bruce Campbell, Garry Williams, Edmund Kugbila, and Jeff Byers on injured reserve. They’ve filled in by picking up Geoff Hangartner and Travelle Wharton off waivers, but both of those guys are unrestricted free agents and Chris Scott and Byers are both restricted free agents this offseason, too. Gettleman will have free reign to retool the secondary where he sees fit. Both Melvin White and Robert Lester performed well as surprising undrafted rookies, but both starting safeties Mitchell and Quentin Mikell are unrestricted free agents and Munnerlyn and Drayton Florence are as well at corner. The building blocks are surely in place for the first back-to-back winning seasons in franchise history, but there’s still work to be done. "Everybody has been asking questions about the past, and for me with the age I’m at right now, this is one of the best teams I’ve been around and we’ve got some young players that are going to be dynamic," Smith said.